To contribute to this consultation, please click on the ‘How to get involved’ tab. The Park and Ride will begin operating again at Easter 2019. Commencement date to be announced. Please Note, the park and ride will not be available on 13th April, 11th May, 13th July and 14th September, due to the unavailability of the the Noch Deighton card park in Tasley. We apologise for any inconvenience this may cause. (The Chamber is excited to be working in partnership with both the Endowed School and Nock Deighton in providing the service). Regulations regarding the use of ‘A’Boards in town. The next Chamber meeting will take place at 6pm on Monday the 14th January 2019. To be held at The Shakespeare Inn, West Castle Street, Bridgnorth. Bridgnorth Chamber of Commerce was asked by chamber of commerce members, other local businesses and shoppers who need to drive into town to shop, to fight the plans to build shops on the Old Smithfield car park. See below for information about the Inquiry which was instigated by the Secretary of State. Bridgnorth Chamber of Commerce retained a barrister who specialises in planning law, and a retail consultant, both of whom attended the four days of the inquiry. At the end of the inquiry, no award of costs were requested by or made to Shropshire Council or Bridgnorth Chamber of Commerce, therefore chamber members do not have a legal responsibility to pay costs. The majority of the chamber’s costs have been voluntarily donated by members, local businesses, market traders and individuals. A small amount of money is still required. Please consider donating towards the costs incurred by the chamber in attending the inquiry. If you can help us finance the legal costs, please click this link. The Chamber attended the Secretary of State’s inquiry into the decision by the Shropshire council planning department to approve the erection of five shops on the Old Smithfield car park. Specialists were employed. Anyone wishing to make a donation to the Chamber’s legal costs in fighting to Save Old Smithfield car park can do so at any shop displaying the SOS posters, or by sending a cheque to Bridgnorth Chamber of Commerce, c/o Central Power, Market House, Listley Street, Bridgnorth WV16 4AW. The Chamber were originally offered an amount of money possibly up to £100,000 by Ziran to help finance the Park and Ride IF we agreed to support their development on the Old Smithfield. However this would only fund the service for a specific amount of time, after which the town would be left with a permanent lack of parking in the town centre. It therefore made no commercial sense to accept what many might consider to be a bribe, and the Chamber refused the ‘deal’. Shropshire Council Planning subsequently accepted the money and supported the development. The Chamber objected to the Secretary of State who nullified the decision made by Shropshire Council, and instructed them they could not make any further decision with regard to the land in question, but that a Public Inquiry would take place and the application would then be decided by his Government department. The Public Inquiry into this was held in November, where Shropshire Council, concerned at the situation, decided to spend taxpayers money on hiring a barrister to try to defend its position, together with three expert witnesses. The developer also hired a barrister and two expert witnesses. The Chamber of Commerce made the decision to become a rule 6 party so that it could put the legal arguments against the development, and hired a barrister and retail impact assessment expert to present the case for refusal. Anyone is entitled to apply to be a rule 6 party at a Public Inquiry, and contrary to misinformation being spread by someone elsewhere, no costs can be awarded against someone who does this, regardless of the outcome, as long as they abide by the instructions of the Inspector and do not deliberately act unreasonably in order to cause other parties to incur additional costs. During the Inquiry it was discovered that whilst Shropshire Council had initially refused to accept the developer’s proposal to put additional parking spaces behind the retail units next to the loading bays, as it was considered dangerous, they had subsequently agreed to this on the understanding that they would not be responsible for them!!! The Inspector insisted on seeing detailed proposals for how this would work, and how pedestrians would access these spaces, and will consider whether this is acceptable. The Chamber argued that cars using the same entrance as the delivery lorries to access these spaces, and people having to then walk along the edge of the area where the lorries turn round with only a white line on the ground to separate the two was dangerous and unprecedented in terms of health and safety. I believe we will win this argument, particularly as Shropshire Council have decided to distance themselves from it. It was also discovered that Shropshire Council had not considered how the coach spaces on Innage Lane, currently used by the school buses, would be turned into car parking spaces for weekends but reserved for buses during school days, and had not consulted the Endowed or St Leonard’s schools on this proposal. Again the Inspector insisted on seeing detailed proposals for how this would work and will consider whether this is acceptable. Again I believe we will win this argument, as it was pointed out it would only take one car to misunderstand and park in the middle of the coach bays on a school day to cause chaos and danger to children. The Inspector is due to present her report to the Secretary of State in February 2018 for his consideration, and he will then make the decision as to whether to allow or refuse the planning application. We do not yet know when that decision will be made. Anyone wishing to make a donation to the Chamber’s legal costs in fighting to Save Old Smithfield car park can do so in town at any shop displaying the SOS posters or by sending a cheque to Bridgnorth Chamber of Commerce, c/o Central Power, Market House, Listley St, Bridgnorth WV16 4AW. The Public Inquiry ended this evening after 4 days of evidence and cross examination between agents for Ziran Land (Bridgnorth) Ltd, Shropshire Council Planning Dept and Bridgnorth Chamber of Commerce. This has been a complex case with a number of matters coming to light during the Inquiry which had not been considered by the applicant or LPA despite the application having been approved in March. These matters, some of which concerned public safety, have had to be addressed by those parties during the Inquiry, and in particular a decision will be taken by the Inspector as to whether the proposal to allow public parking behind the units adjacent to the loading bays will be permitted as part of the application, given that Shropshire Council are not willing to take responsibility for this area. The Inspector will now make visits to the town and produce a report for the Secretary of State who will make a decision on this planning application. That decision is expected in Spring of 2018. The Chamber would like to reassure members that this is NOT an appeal, and no costs can be awarded against it if the decision is that the planning application can go ahead. The Chamber believes it has put a strong case for refusal of the application on behalf of members and remains hopeful that the Secretary of State will find in its favour. The Secretary of State has agreed to the request by the Chamber to ‘call in’ the planning application for the ‘Old Smithfield’ site. The Chamber are grateful to Philip Dunne MP for his support in this matter. Shropshire Council have been instructed that their decision to give planning consent is now effectively cancelled and the decision will now be made by the Secretary of State. A Public Inquiry is now due to be held in November 2017 where the legal and other arguments will be put to the Inspector. The Chamber’s legal team are working hard on behalf of the membership to ensure that land Compulsory Purchased by Bridgnorth District Council, to ensure it would remain as car parking for the town, will not now be built on against the wishes of the electorate. We’ve launched a campaign to raise money for our fight to save the Old Smithfield car park from development and we have set up a crowd funding page. If you can help, please click the link below. The Chamber of Commerce will be presenting its petition to the planning officer at Shirehall on Tuesday 9th August, the current official deadline given for objections. The petition has now been gathered together and we have over 6,500 signatures at the last count. Journalists will be present for the handover and an interview with Chairman Steve Robbins will be broadcast live on Radio Shropshire the morning before from the Old Smithfield site where the development is proposed to be built. We are very aware of the serious concerns that many members have regarding the proposed development, the Chamber acted swiftly as soon as we were made aware of it, and believes the petition will send a strong message out about the feelings of those who shop in the town. There has been much discussion locally, and on social media, regarding what is and what isn’t eligible criteria for a planning application to be refused. The Chamber would like to advise members that it put together a sub committee to co-ordinate its challenge to the proposals, giving it access to as much historical information on the site as is possible to get, and the very best legal advice on planning matters. In addition to the petition, substantial legal questions have now been raised which will need to be addressed. For obvious reasons we cannot discuss these matters, but we would like to reassure members that we are working hard on your behalf and certainly do not consider this a lost cause. The Chamber anticipate it is unlikely that there will be any further developments before September at the earliest. 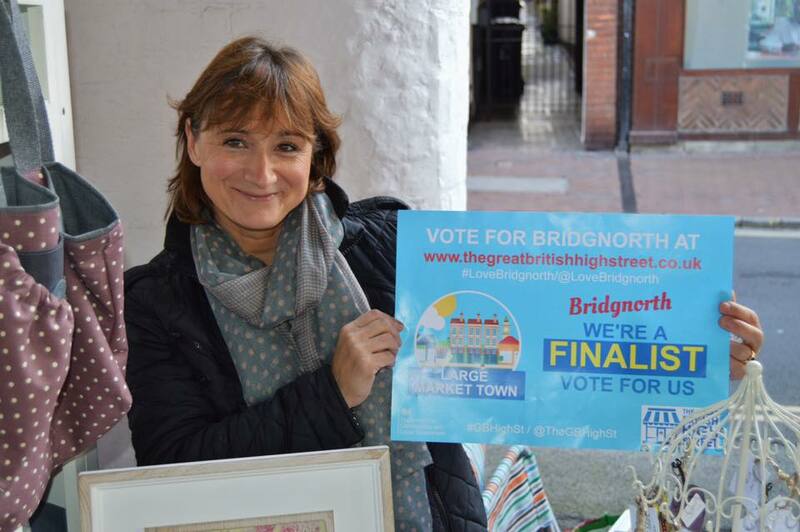 Bridgnorth Chamber of Commerce are delighted to hear that the Town’s bid to win the Market Town category of the Great British High Street awards has been successful, and would like to congratulate Sarah Stevens and Sally Themans and thank them for all of their efforts. The Chamber recognised the value of winning this prestigious title and were pleased to offer financial support to help with the publicity. We are especially proud that our Park and Ride was mentioned by the Judges as a successful community led initiative which helped the bid. The National publicity that this has generated will have a positive effect on tourism over the coming year, but more than that, winning the award will surely encourage all of the community to continue to work together to improve our town. The Bridgnorth Chamber of Commerce exists to connect and support local businesses which are registered within Bridgnorth and the surrounding areas. All businesses, large and small, are encouraged to apply to join the Chamber. The aim of Chambers of Commerce is to promote, advance and protect the commercial, professional and general interests of the community and the local economy. A Chamber of Commerce has existed in Bridgnorth for over 40 years, and has been instrumental in protecting the rights of the town’s historic market, which is protected by Royal Charter. Bridgnorth received the earliest Charter granted to a Shropshire Town by Henry II in 1157. Bridgnorth Chamber of Commerce relaunched itself in November 2014 with a newly elected Council determined to grow the membership and work on new initiatives to support them. Monthly social meetings now take place on the last Thursday of the month, where members can drop in and network with other members in a more informal setting, and discuss any issues with the officers of the Chamber. Affiliation with Shropshire Chamber opened up the opportunity for members to attend the breakfast meetings held at Bridgnorth Golf Club, with all the County wide networking opportunities that gives.